The post-debate survey by the Pew Research Center for the People & the Press, conducted Oct. 4-7 among 1,006 adults, finds younger Americans are especially likely to be “dual-screeners,” following the debate live on both television and a computer or mobile device. 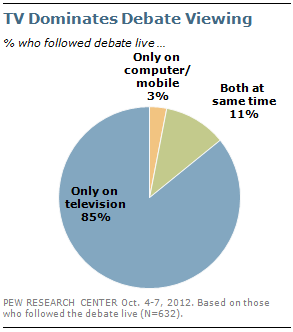 Overall, 32% of those younger than 40 say they followed the debate live online, including 22% who followed it both on television and online, and 10% who followed exclusively on a computer or mobile device. Those 40-to-64 are less likely to have followed live online (11%); just 1% followed only online, while 10% followed online as well as on television. 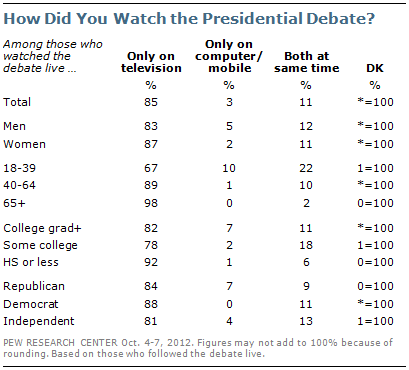 Very few Americans 65 and older followed the debate live online (2%) and none followed live coverage exclusively on a computer or mobile device. While Twitter and Facebook provide an outlet for a range of debate reactions, only a small share of Americans are actively participating in these conversations. Only about a third of those who followed the debate in real time online – representing 5% of the overall debate audience– say they shared their own reactions to the debate online. This includes 8% of live debate watchers younger than 40 and 5% of those 40-to-65. 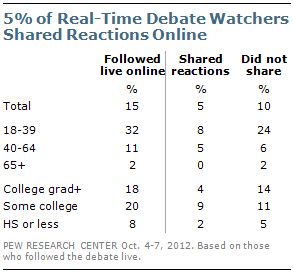 No real-time debate watchers 65 and older reported sharing their reactions online while the debate was going. Overall, 83% of Americans followed any coverage of the first presidential debate either live or after the debate had already occurred. As with live coverage, television is the dominant source, outpacing other traditional sources, such as newspapers and radio, as well as online sources and social networking sites. Seven-in-ten Americans (70%) followed debate coverage on television, more than twice the percentage that turned to any other single source. About as many say they followed any debate coverage in newspapers (32%) as online or on a mobile device, such as a cell phone or tablet computer (29%). 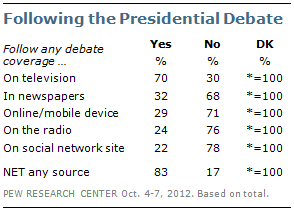 In addition, 22% say they got debate coverage from social networking sites like Facebook or Twitter. About the same percentage (24%) followed debate coverage on the radio. About a third (36%) of Americans got any debate coverage online or from social networking sites; far more (78%) say they got coverage from traditional sources, including television, newspapers, or radio. Among those younger than 40, however, the gap is narrower: about half (51%) followed coverage online or on social networking sites, compared with 70% who followed coverage either on television, the radio, or in newspapers. About a third (35%) of those 40-to-64 say they followed debate coverage online or on social networks, compared with 81% who got any coverage through television, newspapers, or the radio. 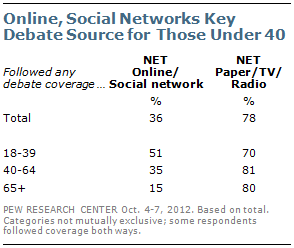 Just 15% of those 65 and older followed the debate digitally; 80% say they turned to traditional sources for debate coverage.